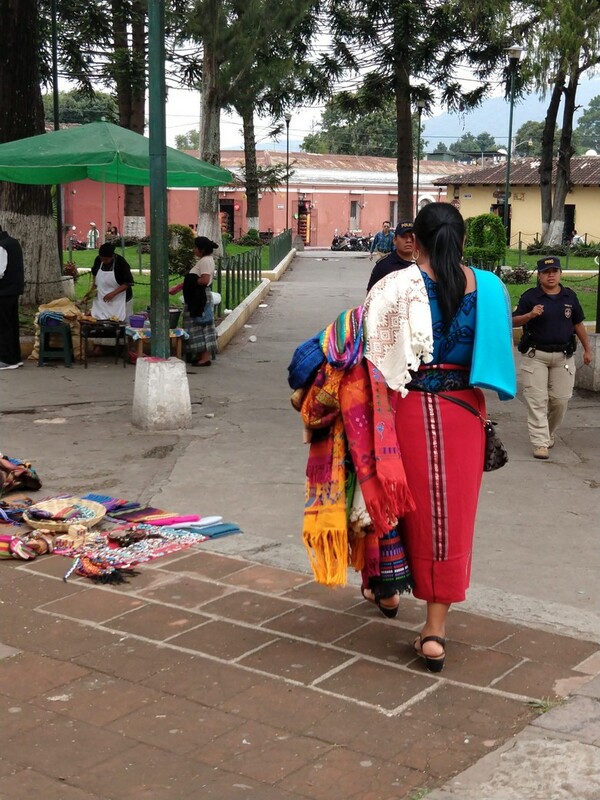 The Plaza Mayor in Antigua Guatemala is always buzzing with activity filled with purveyors selling a variety of wares or people just coming to visit with friends. I am sitting in a small but quaint restaurant Cafe Condesa eating a simple breakfast of queso filled croissant and cappuccino. I can’t help but people watch for hours, admiring women wearing the amazingly colorful weaved traditional attire. Their children running throughout the plaza laughing, playing and selling smaller trinkets usually toys of some sort. 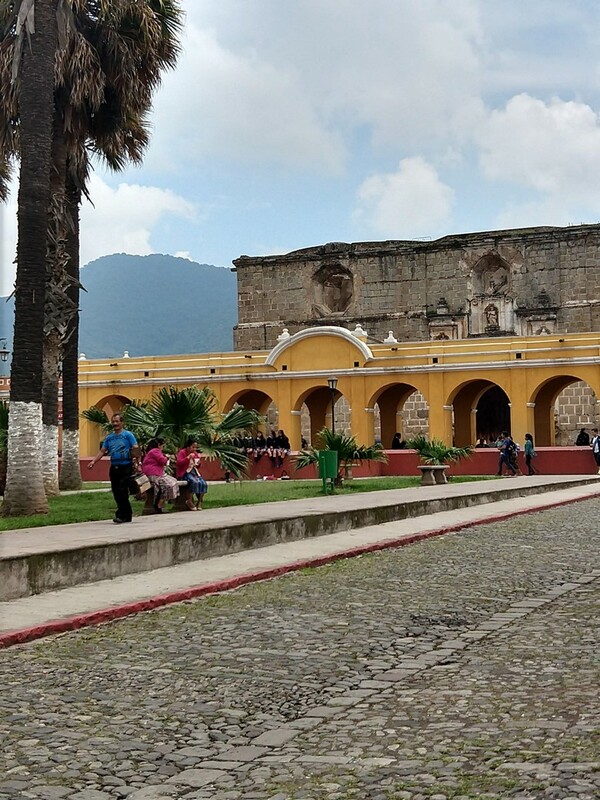 The little colonial plaza is surrounded by restaurants, shops, and breathtaking scenery. From here I can see the mountains that seem to completely envelop the plaza. It’s rainy season here in Guatemala but so far I’ve had good luck today the skies are clear and the weather nice. The perfect compliment to my morning. After breakfast, I walk through the plaza taking in the full energy and history of it. I find myself intrigued by the Fuente de Las Siernas an interesting piece with four mermaids, one on each side holding their breast. The fountain waters erupting and falling into the fountain bowl from their breast. This was designed and built in 1773 by Diego de Porres who was considered to be the best architects of the time. I’m enthralled with the care Antigua has taken to maintain the cultural vibe in their colonial town. All the streets are like small ocean waves of clay bricks and sidewalks that are tattered and torn in many places. There are no huge brightly lit signs, no crazy logos nothing. While there are many modern eateries slinging fast foods they don’t stand out like it most places. Here they blend in with maybe a small wooden sign out front. I walk by such a place barely aware of its existence. 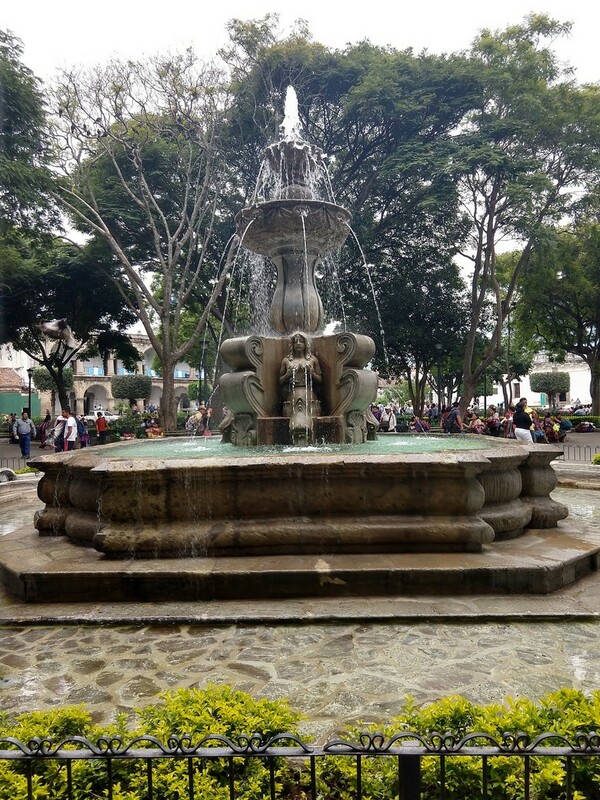 I continue to walk to the other side of the plaza finding an outdoor communal washing basin that for centuries many of the Mayan’s used to wash clothing. I can only imagine what it must have been like to carry a household of laundry into the center of town to be hand washed in this pool of water. It is not used as much as in the colonial times but from time to time utilized by those who still have no running water or nowhere they can clean their clothing. The structure is quite beautiful and very well maintained. 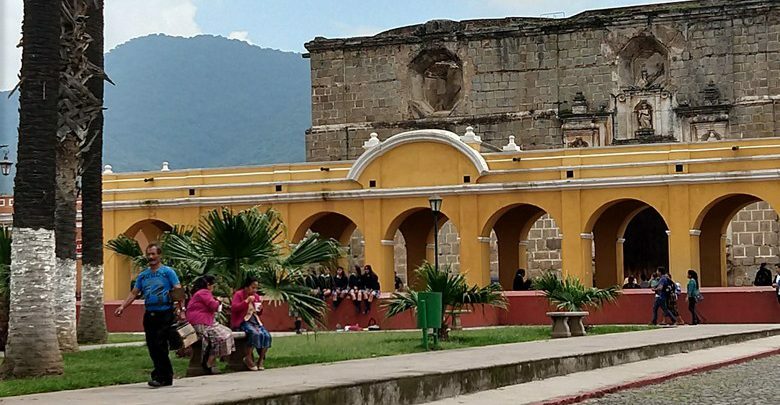 On another side of this plaza proudly stands the Palacio de la Capitanes Generales residence, It’s a considerably large building flanked with arches that hold up a roofed walkway. 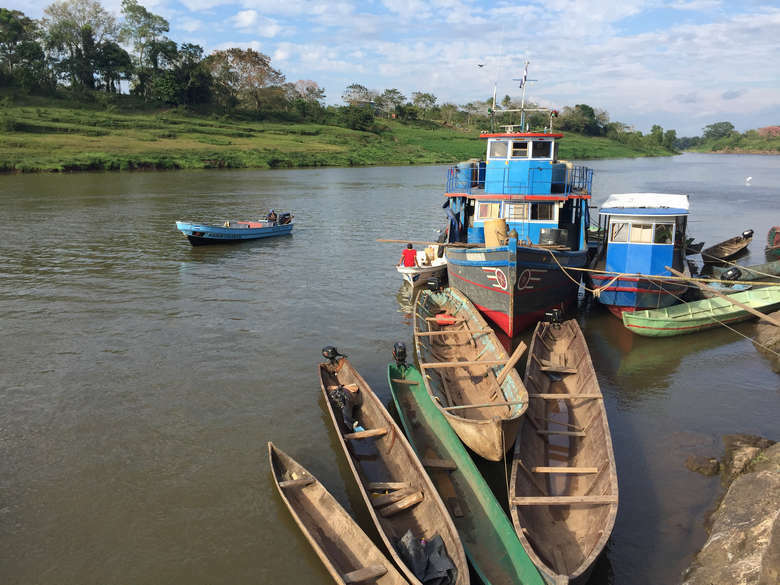 It is now the headquarters of the Guatemala Institute of Tourism, the National Police, Tourism association and the Sacatepquez Department government. It was originally built in 1558 and has been reconstructed many times over the centuries due to the well-known earthquakes here. The beauty of the building is still preserved well and its glory shines. I envisioned a time when it would have been lived in as a home the grandiose feeling it must have had. Amazed by the sheer amount of work to create such a building without the use of machinery. It’s already been a long morning by this time, I’ve been wandering around just in the plaza area for hours, noting my google fitness alert of just over 8,000 steps. 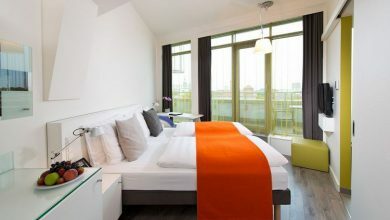 I decide to head back to my hotel for a little R and R maybe a quick nap before dinner. Interested in being a member of our TravelTribe and having your content shared? 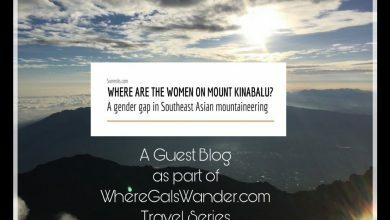 Where Are The Women On Mount Kinabalu? 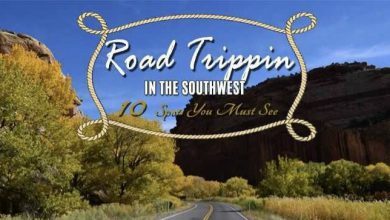 Road Trippin In The Southwest!